Baptism is a moment on the journey of faith, when we make a personal and public declaration of faith in Jesus as Lord. At Dagnall Street baptism takes place by full immersion in water. It signifies the end of our old life and of being born again to new life in Christ. It speaks of repentance and cleansing, of being united with Christ in his death and resurrection, and of witnessing to the call of God upon our lives. Baptism is also about receiving God’s Spirit for service in the church and in the world. 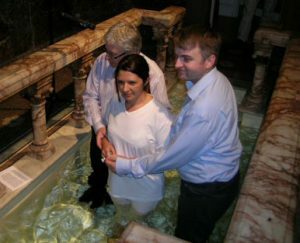 The person baptised is received into membership of the local church. If you wish to ask more please contact Simon Carver (01727) 854041.